Shooting Review: The Walther CREED | Eagle Gun Range Inc.
One common criticism of the firearms industry these days centers on the overall lack of innovation. 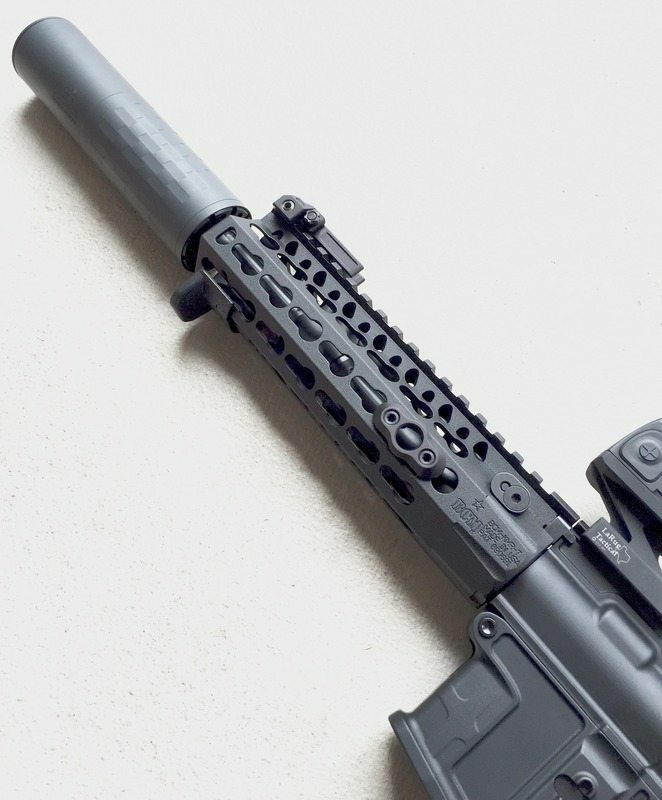 There are some cool doo dads becoming available now and then, but these are usually from the firearm accessories realm; particularly with ARs. Pistol and rifle newness these days generally comes from aesthetics rather than technology. But one recent innovation is the broadening category of inexpensive-but-good guns on the market. Manufacturing tech is outpacing gun tech and the result is a boon to the buyer’s wallet. Lately there have been a handful of budget-priced pistols of relatively good quality entering the market. Last month I reviewed one of these, the Canik TP9 SA, and was duly impressed. This month I spent some time with another of these new budget pistols: the Walther CREED. Here follows my shooting review. This will soon begin to sound trite, but it’s a primary factor: You’ll want to consider the Walther CREED because of the fantastic price. With an MSRP of $399 you get what sure seems to be a quality-built pistol from a good manufacturer. Walther makes some great guns…and, admittedly, some duds…but the CREED doesn’t seem to skimp much while carrying a bargain price tag. My very first thought when I saw the pistol lying on the counter was, “Wow, that’s a big slide on a little grip!” The slide is a bit tall, the bore axis is pretty high, and with that telltale Walther grip profile the result is not the most attractive image. Actually, the exterior slide milling and the frame finish are quite nice. The geometry, while comfortable, is not necessarily beautiful. It’s an exaggeration to say it looks like a Hi-Point, but it kind of does. Mostly, though, it looks like a mildly modified PPQ. I thought the CREED to be a striker-fired gun, but when I started shooting I noticed the bobbed hammer. The action is pre-cocked double action and the trigger is quite nice. I genuinely wondered where the cost savings was brought to this pistol. 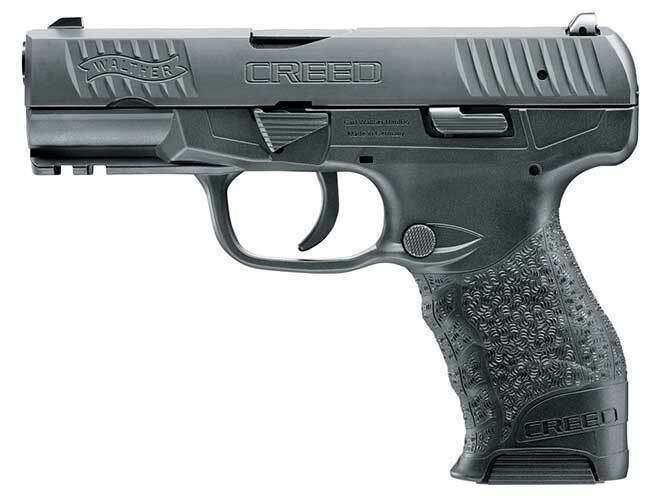 Like most polymer-framed Walthers, the CREED is comfortable in my hands. I noticed that the grip angle is more vertical than what I’m accustomed to, but I quickly found the proper position for presentation. I like the position of the external controls and I found the slide lock lever and magazine release button to be easy and comfortable to use. The grip’s smallish diameter was nice for my medium-sized hands and I found the trigger reach to be good for me. The CREED’s high bore axis did result in more muzzle flip than I prefer. While it’s not a violent gun in the hands I did wrestle with recoil management more than I do with my smaller Glock 19. I prefer a small ledge up front so that my support-hand thumb can help manage recoil, but the CREED’s minimized takedown lever did not offer much purchase (an anecdotal preference). I did notice, though, that I had no trouble getting sights back on target for quick follow-up shots. I found the 3-dot sights easy to pick up and this pistol made accuracy easy for me. The trigger is pretty good. As advertized it is 6-6.5 pounds, but it felt like less to me. This was probably due to the smoothness of the press action. The bobbed hammer is mostly cocked and the last bit of pre-travel before break takes the hammer back with it. There is a lot of soft take-up then a bit of firm travel (for the hammer), then a nice crisp break. The reset is rather long, but not so long as to make a big thing of it. The frame is nicely done, but it has “Warning: Read Safety Manual” cut into the right side and “CREED” is milled into the left side of the slide. Not terrible, but they’re both a bit tacky in my opinion. The frame’s texture looks nice, but it is almost non-abrasive. Like every other polymer pistol, you’ll have to stipple this one. The lack of replaceable backstraps is the first nod to the budget price, though the grip ergonomics are quite nice as is. The 3-dot sights are good for daytime. They are replaceable and the rear is drift-adjustable. The lack of an external safety is nice to see here and the other external controls are made to ride very close to the frame; a nice touch! The magazine release button is comfortable to engage and is reversible for you lefties. There’s also a picatinny rail for your favorite light or laser. The magazines are steel and appear to be very nice. If you’re going to sell a good-looking, good functioning pistol on the cheap, you’re going to have to cut corners somewhere. I found a couple inside. I had a look at the internals and noticed that the milling of the interior of the slide is not fantastic. It’s not awful, but milling marks are clearly visible. 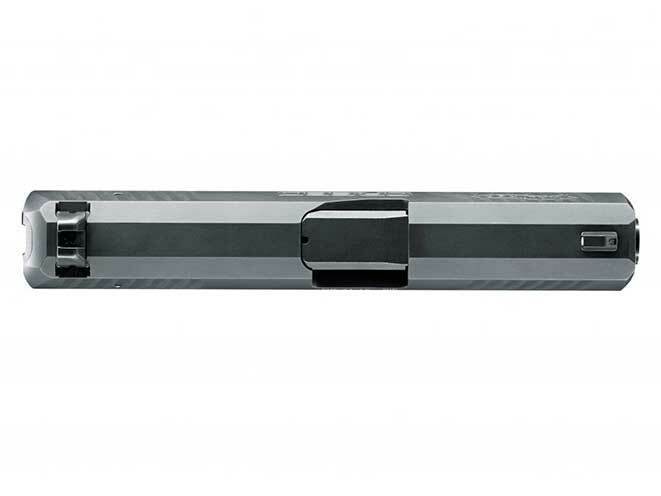 The recoil spring assembly guide rod is plastic rather than steel. The barrel is a bit odd, too. It appears to be three pieces: 1) the barrel & chamber, 2) the chamber block & lug assembly around the barrel, and 3) the feed ramp. These three components appear to be separate pieces that are welded together. Note that I say “appears to be,” as I could be mistaken, but there is at least a clear weld of the feed ramp to the back of the chamber. I’ve never seen this before. Makes me wonder what’ll happen after a few thousand rounds. The price! 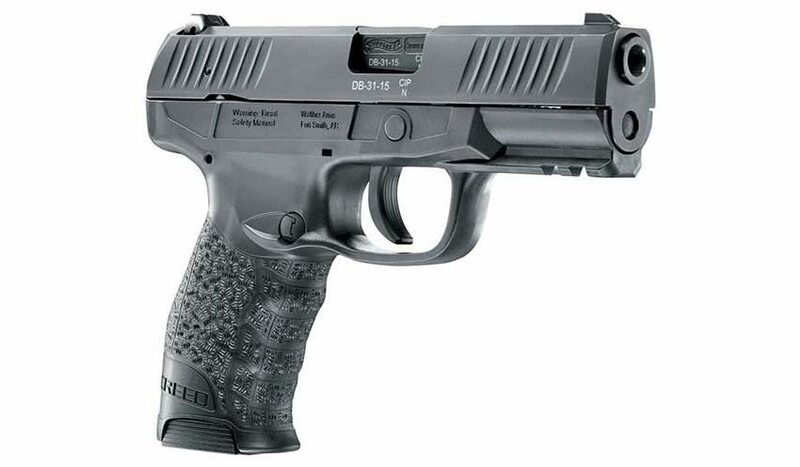 At $399 (or perhaps even less), the Walther CREED a lot of gun for the price, and a good value. The exterior quality of both the slide and the frame, and their components, is high. The grip is comfortably contoured and likely small enough for people with smaller hands. There’s nothing at all wrong with its accuracy. The Walther CREED is kind of a chunk of a pistol. The high bore axis delivers a bit of muzzle flip and the capacity (16+1) is a bit low for a full-size gun. The plastic recoil spring guide rod and the welded-component barrel are perhaps not built for longevity. I would immediately replace the recoil spring with a steel-guide-rod version. Very nice overall, but you can’t configure the grip to your specific preference. The muzzle flip and non-existent grip texture functionality are strikes against this one. I found nothing wrong with its accuracy. I had 3” groups at 15 yards with no support. It will hit what you aim at. The CREED is not a concealed-carry-built pistol. It’s surely possible, but not optimal by any means. After shooting the Walther CREED, I hold that it is a good value as an open-carry or home-defense gun. While a few corners were cut with a few components, there’s a lot to like here. If I were new to guns and wanted a good all-rounder, I wouldn’t hesitate to pick up this low-priced gem. It’s in the rental case at Eagle Gun Range. Take it for a spin and see what you think! I always learn something from reading your reviews. Just bought and shot my new Creed . I was concerned with the trigger pull. Only shot 19 Glock Before Where Do I Purchase the The Spring And Rod Replacement? ive fired around 250 rounds though my Creed. Zero jams and accurate. The capacity of the 9mm Creed is actually 16+1, not 15+1. I fired about 750-800 rounds. Still working fine!!! I believe that you have a typo. You list it as having a 15-round magazine (15 + 1), but it is 16 rounds (16 + 1). Otherwise, it’s a great, concise review. I have this pistol, and am quite happy with it so far. Thanks for the quick eyes. Typo corrected! I got a brand new one for $269.99 and $19.74 shipping from CDNN Sports in Abilene, TX. Haven’t fired it yet, but it feels good in the hand and looks like very decent quality. Forgot. I have an FFL, but am not active. Davidson’s wholesale price to dealers was around $309 plus shipping. Should I even think twice about buying a new CREED for $250.00 if given the chance? Your opion on my Sig p250 v.s. the Creed.? I have never shot the p250 so I’m afraid I cannot comment. I believe the Sig P250 came out about 2007 . It also is DAO at about 6.5 to 7 pound trigger. VERY smooth for a DAO. Mine is a 2008 and shoots better than new ones. Try one and let me know. Thanks for your reply. It’s a 16 +1 mag, not 15+1. Have the PPX and Creed. Creed is much better in the grip, slide and general appearance. Trigger pull is more like 5 per digi scale. Feels even less. Smooth and snaps at end. Frame feels stronger and no bump in the palm anymore. Never had the flippy recoil even though high centered. Mags work between the 2. As for the barrel, Walther revolutionized the process of using the perfect metal for the lug, barrel and chamber separately instead of one metal for all on the PPX. Iirc, it’s a bonding process that adds the pieces together but not just welding. They are actually very strong and I’ve yet to see one with a broken lug or any separation of parts. As for the recoil guide rod being plastic, well they’ve been out since mid 80s in Glocks with no ill. I prefer a good steel one in some guns but hey, it’s a polymer gun. Any collection would benefit from one. Any new shooter could learn on this and I doubt they’d wear it out. Get it, you won’t regret it. 25 year gunsmith. FWIW. 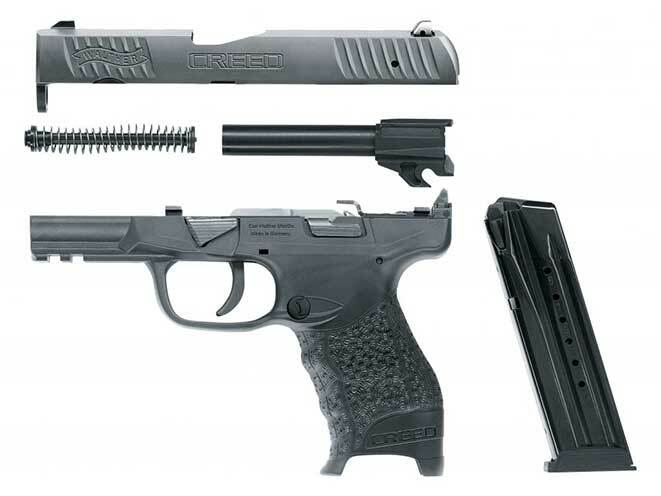 Between the Ruger Security 9 and the Creed , which would you buy. Both being below $400.00?